A thriving hub of independent traders, market stall holders and artisan products, Green Park Station is now home to Bath's indie community. 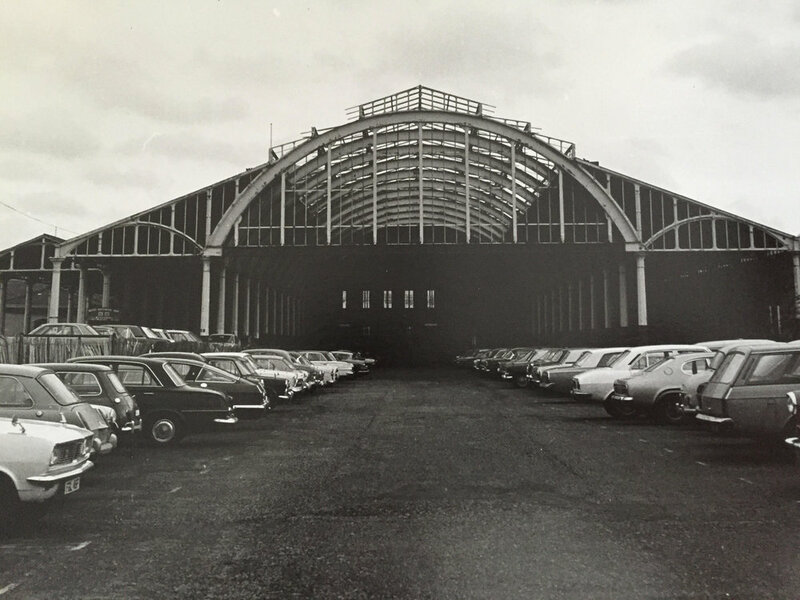 We recently stumbled upon some old images of the former railway station during its in-between years, from its decommission in the late 1960s and it the redevelopment in the 1980's. Station exit view. Pre development of Green Park Station. Now the station side of Green Park Brasserie, part market, part car park for Sainburys. Looking out from the back of the Green Park Brasserie, home to Bath Pizza Company. Boarded up. The Station side facade between the active use of the station and its redevelopment. The station is now a thriving independent community of traders and markets throughout the week and weekends. Green Park Brasserie and Bath Pizza Company occupy the old station booking hall and platform space. 'Bath Green Park' Station was originally known as Queen Square - the square still some 500 metres from the station. Green Park Station was opened in 1870 and acted as the terminus of Midland Railway's Mangotsfield and Bath Branch Line. The front of Green Park Station in Bath after the station was decommissioned. The original cobbled front pavings remains today, but the road space has been reconfigured with parking only at the rear of the building in the former station. Bath Green Park station booking hall, now Green Park Brasserie restaurant. The building underwent a restoration which involved cleaning the brick work and adding a new floor to create a two story building, now used as a function room. Live music, great food and local traders on a Saturday morning at Green Park Station in October 2016. Architect John Holloway Sanders designed the station buildings which have since been renovated after the station was decommissioned and the last passenger train left Green Park in 1966 following the Beeching Report. With the last goods train leaving the station in 1971 it wasn't until the 1980s when the space was redeveloped and Sainburys Green Park store opened in December 1982. Reverse view, approaching the station. Green Park Station, Bath before the redevelopment during the 1970s. The popular Bath Farmers' Market which runs every Saturday from 8am - 1.30pm. Local farmers, producers and traders from Bath and Somerset sell meats, veg, cheeses, apple juice, free from produce, cakes, breads, olives and more. Side angle. The facade of Green Park Station, Bath - this was once the entrance point to the booking hall where travellers would have bought their ticket before going through into the terminus. Today the building's stone work has been cleaned show the Bath stone's original colour. A local theatre group commemorating the last train to leave Green Park Station. The old booking hall at Green Park Station, Bath photographed long after the last train and passengers had left. The Green Park Brasserie is one of Bath’s best known independent restaurants. Based in the heart of Bath, just 5 minutes stroll from the Roman Baths, Bath Abbey and Bath's shops, we’ve been serving award winning food and drink for over 25 years.